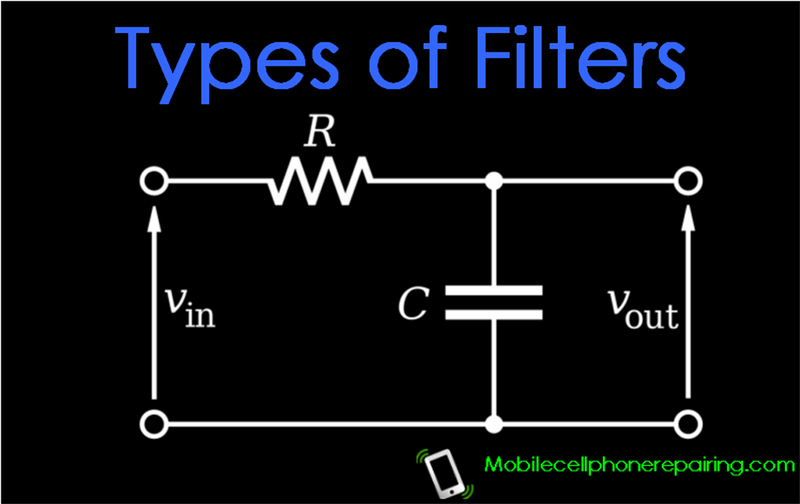 Types of Filters in Mobile Cell Phone and Their Function – Learn about different types of filters and filters used in mobile phone and their function. Only pass-band and one stop-band frequency is available in most general type of filters. A low-pass filter allows only a specific frequency to pass and stops or rejects all frequencies above the low-tuned frequency. A high-pass filter stops or rejects all lower frequencies below the set frequency and passes the higher frequencies. This is a type of filter that passes only a specific band of frequencies and stops higher or lower bands. This type of filters may also be tuned for one or more pass bands. This type of filter stops a particular band but allows passing high or low bands. This band-stop filter is almost a low pass filter and is a combination of band-pass filter. A thin section of quartz can produce resonance effect like an L.C. Circuit by mechanical vibrations. This property of quartz crystal is due to Pizo-electrical effect. When this is compressed, rotated or stretched, this crystal can be stimulated by input voltage or generated output voltage. There are one or more piezoelectric crystals in a crystal filter which make resonant or anti-resonant circuit. Therefore, crystal filter is an electronic component that passes a selected frequency like a resonant filter. SAW filter is used to receive desired frequencies from the range of frequencies. A SAW filter produces ultrasonic waves which are prepared by aching technique. It is made on a plate of piezoelectric material. Piezoelectric materials convert electrical signal into mechanical vibrations. Two electrodes are made at the output end of the plate like the teeth of combs combined to adjust. These tooth like electrodes perform as tuned electrical circuit. Signals of appropriate wavelength and phase can be obtained from it. Similarly two electrodes are provided at the input terminal of the plate which performs as receiver. When AC signal is given at the input terminal of a SAW filter, mechanical vibration is produced because when the signal passes between the two electrodes at the input terminal and reaches piezoelectrical plate, this vibration is converted into mechanical waves and the electrodes at the output terminal receive these waves and send out the desired controlled frequency of the phase after converting them to electrical signals. High input impedance of SAW filter is the prime drawback of this filter. As a reason, the input signal has to be amplified before directly sending to the SAW filter. Thank you for sharing excellent informations. Your site is very cool. I’m impressed by the details that you have on this site. It reveals how nicely you perceive this subject. Bookmarked this website page, will come back for extra articles. You, my friend, ROCK! I found just the information I already searched everywhere and just couldn’t come across. What an ideal site. sir, can u help me out in repairing an iphone 5 which is hanging while dial or recieve any call also its compass is also not working , i already hard reset and tried erasing my phone, didi u suggest any hardware replacement solution, Please help. I have already written an article on how to repair any dead mobile phone.